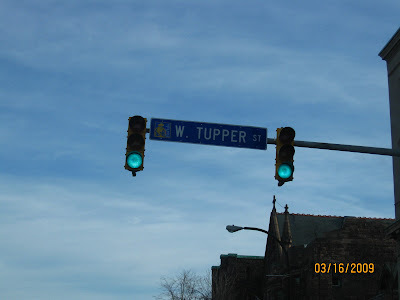 Yup, a quick snap while the green light is on, and off heading to W. Tupper Street. It is nice to catch a quick snapped of some signs, or places while you are in the car. Take note, it is not I who takes the wheel. So, meaning I'll be able to take a shot to just anything I want. Just make sure somebody keeps their eyes on the road. I have seen some great shots lately but I am always driving at the time and hubby can't figure out how to use a digital camera. Looks like your have some nice sunny days. =) Hope you have a great Friday. The lights green you better go before everyone starts honking theri horns, LOL. Fun picture. Every once in a while I take one while I'm driving. Shh don't tell anyone! :) Happy SWF!